The very last day of #AKCookieWeek is here and while I’m sad for it to end, I’m so excited to end it with a bang. Meet my grain free GINGERDOODLE cookies. 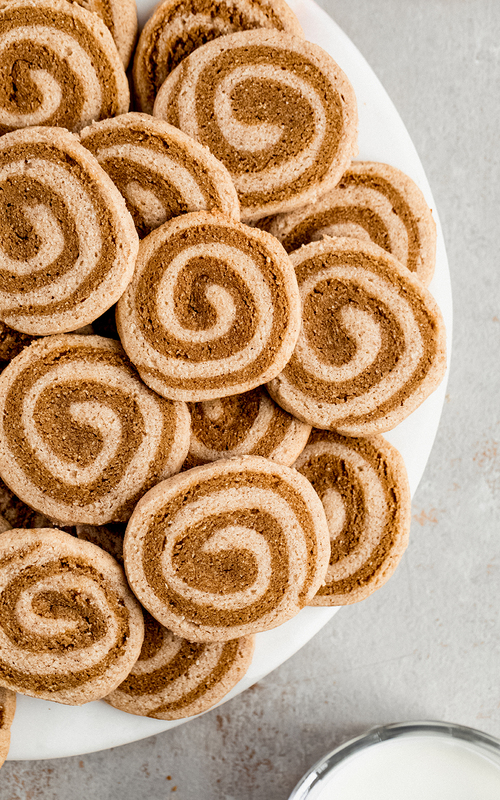 That’s right, they’re a fusion between a gingerbread cookie and a snickerdoodle — what more could you want in a holiday cookie?! To be honest, I had a really hard time naming these. 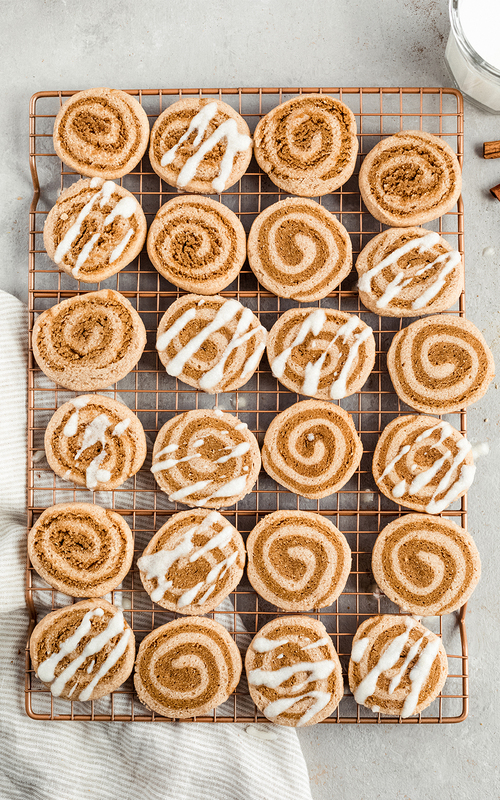 At first, I thought about calling them gingerbread swirl cinnamon roll cookies, which was cute, but not as amazing as your suggestion of gingerdoodle. So thank you, AK community! 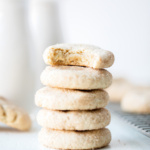 These cookies were inspired by two of my other very favorite christmas cookies: my almond flour sugar cookies and my paleo ginger molasses cookies. I basically infused both doughs together, rolled them up and glazed them with a light vanilla icing. 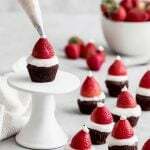 I originally made these right before Thanksgiving and then brought them over to my mother in law’s. We both couldn’t stop eating them! They get softer as the days go on and I couldn’t resist having one with my cup of afternoon almond milk latte. 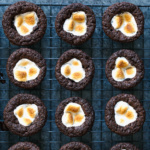 Pretty sure I’m going to be dreaming about these cookies for the rest of my life. Please know that these cookies are both gluten free and grain free, plus they can easily be made dairy free too! I’ve included options in the notes section of the recipe. IMPORTANT NOTE: I haven’t tested these cookies with any other flours. I know I’m going to get the question about flour replacement, but these cookies are meant to be gluten free/grain free. 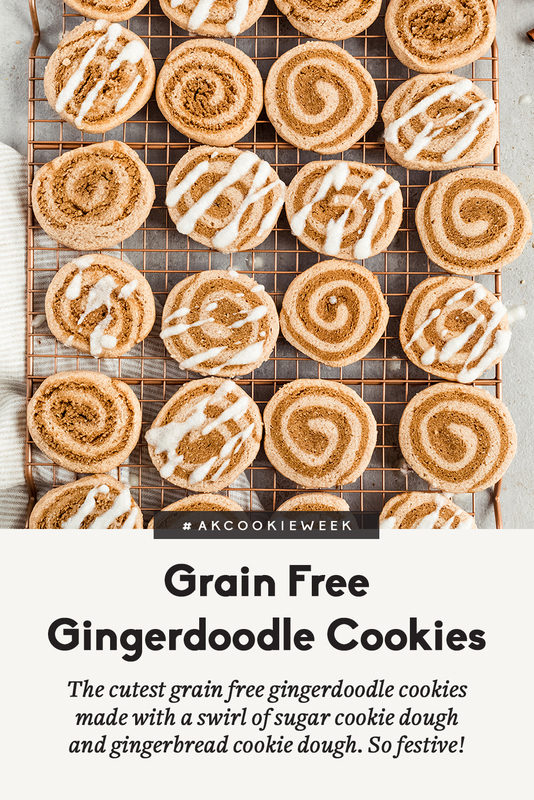 If you’re interested in making a ‘regular’ version of these gingerdoodles, I suggest combining my molasses cookie dough and my brown butter snickerdoodle dough, you should get delicious results. In a large bowl, add in melted and cooled coconut oil, sugar, honey, egg and vanilla extract. Mix until smooth. Next add in almond flour, coconut flour, baking soda, cream of tartar, cinnamon and salt. Stir until dough is well combined. Allow dough to sit for 5 minutes. Roll out dough into a 10×10-inch square between two sheets of wax paper. 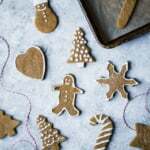 Without removing the wax paper, place on a baking sheet and refrigerate while you make the gingerbread cookie dough. 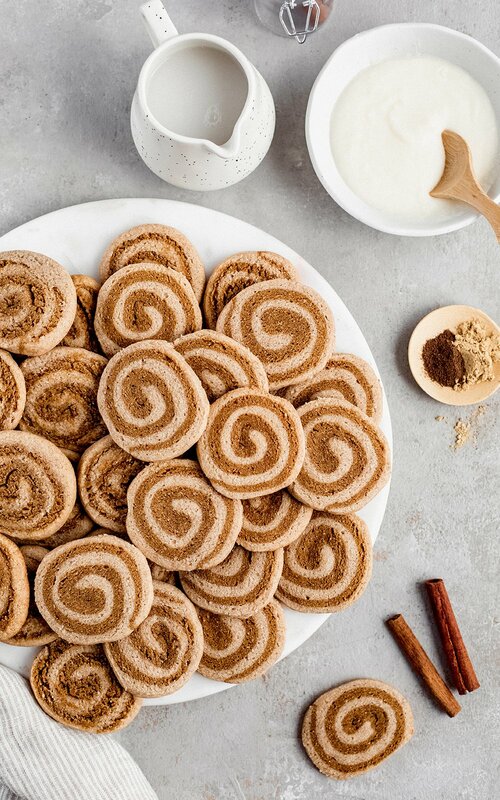 Make the gingerbread cookie dough: In a large bowl, mix together melted and cooled coconut oil, coconut sugar, molasses, egg and vanilla extract. Next add in almond flour, coconut flour, baking soda, ground ginger, cinnamon, allspice and salt; mix well to combine and form a dough. Let the dough rest for just a few minutes. Roll out dough into a 10×10-inch square between two sheets of wax paper. Place in fridge and refrigerate the dough for 10 minutes while you clean up a bit. Remove both doughs from the fridge, and peel off the top of the wax paper from each. 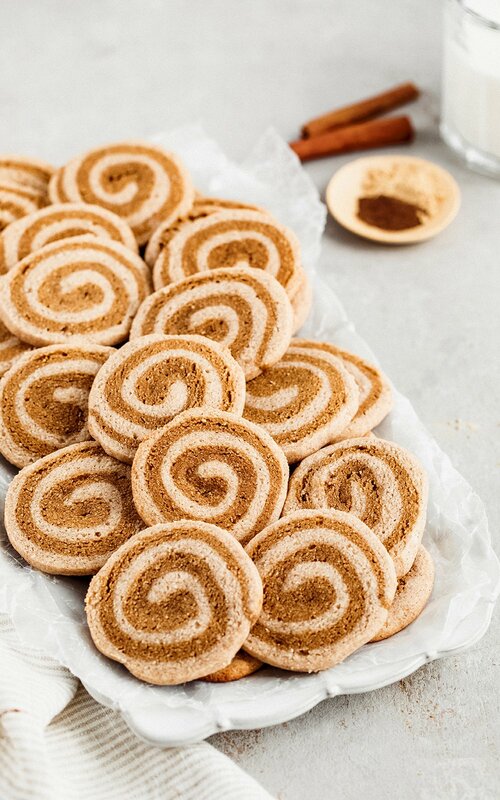 Invert the gingerbread dough on top of the snickerdoodle dough (or it can be the opposite if you want to mix it up!). Use your rolling pin and gently roll over the dough over the top wax paper to seal the layers together. Peel off the top layer of the wax paper. The bottom layer will stay as you roll it up. 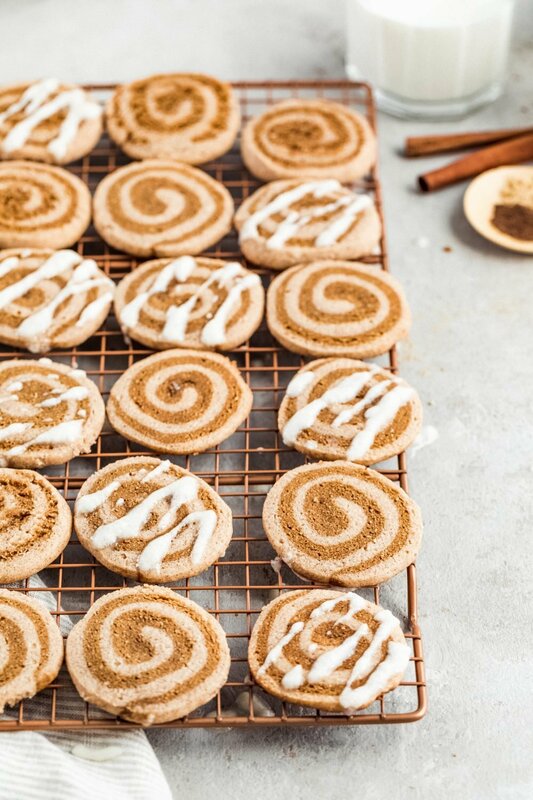 Starting with the edge of the dough closest to you, carefully curl the edge of the dough up and roll with your fingertips, just like you would with a cinnamon roll. You’ll want to roll these pretty tightly. After a log is formed, roll it back and forth on the counter to compact the dough. Transfer the log to plastic wrap, roll it tightly, twisting the ends of the plastic to firmly seal it. With your hands on the ends of the log, push firmly toward the center to slightly compact the dough a little more. The log should be roughly 10-11 inches long and about 2 inches thick, give or take. Refrigerate the log for 15-30 minutes, or place in the freezer for 15 minutes. Preheat oven to 350 degrees F. Line a large baking sheet with parchment paper. Slice dough into about ⅓ inch thick rounds. Set rounds 1 inch apart and bake for 8-10 minutes. Once cookies are done baking, allow them to cool on baking sheet for a few minutes before transferring them to a wire rack to finish cooling. Repeat with remaining dough. To make the glaze: In a small bowl: add in powdered sugar, melted butter, vanilla extract and almond milk. Mix until smooth. 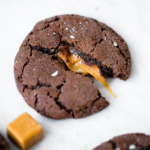 Drizzle a teaspoon or two over each cookie. Makes 20-22 cookies. 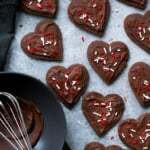 To make cookies dairy free: Use vegan butter or coconut oil in the icing instead of regular icing. 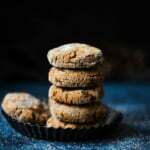 7 Responses to "Grain Free Gingerdoodle Cookies"
I love your recipes so much. I just wish more of them were nut-allergy friendly, or at least addressed the alternatives to make them nut-allergy friendly. Thanks so much.